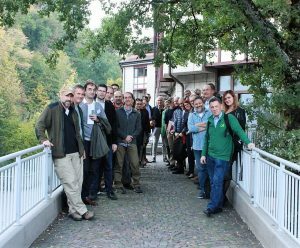 A representative of the NET RISK WORK project, member of GENCAT (regional authority of Catalonia), has participated in the SURE project workshop “Res2Storm – pan-European Workshop on Wind, Storms, and Forests”. The objective of the workshop was to map operational tools and processes to cope with storm events along the crisis management cycle (“intervention”, ‘”recovery”, “prevention”, “preparedness”), in three different operational levels (stand, enterprise and policy/society). We worked for each level in small targeted groups, divided by the different phases of the cycle. It brought together 35 participants from 13 European countries with backgrounds in science, technique and practice. The result was the collection of more than 40 different tools that already exist and work in some countries but that are not strictly defined or that it would be very useful to create. In addition, the participants had the opportunity to meet experts from other parts of Europe dealing with the same challenges and topics, to share knowledge and experiences and to work together.